Get free advice and estimates from skylight specialists in your city. Creating a bright, sunshine-filled space offers more than a reduction in electricity cost. Natural sunlight boosts your mood and provides your body with needed vitamin D, but not all of your home has access to enough sunlight from standard windows. In the sections below, we will discuss traditional skylights and solar tubes in order to help you determine if you want one of these to brighten the dark or artificially lit areas in your home. Skylights are glass, acrylic, or polycarbonate 1 windows set into the roof of your home. They are usually rectangular and consist of three main components. The glazing is the clear window. 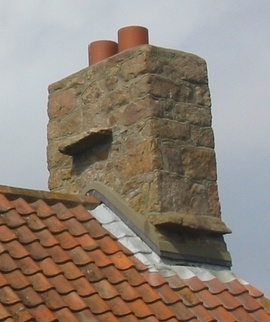 It is surrounded by the frame and connected to the roof by flashing 2, which helps prevent leaks. Sizes can range from 12 x 12-inch squares to large rectangular areas. Bigger is better when it comes to skylights, but the size should never exceed 15 percent of the square footage of the room below. Solar tubes are also called sun tunnels, light tubes, and tubular skylights, but they are all structurally similar. An acrylic or polycarbonate 1 dome installed on the home’s roof catches the sunlight, which is reflected down a rigid or flexible sheet metal tube in the attic before shining on the diffusing lens in the room’s ceiling. They can be 10-inch, 14-inch, or larger. Both skylights and solar tubes shine light from above the home into the interior. Therefore, they can only be used on the building’s highest floor. Installation is more difficult for the skylight because it requires more carpentry work than the installation of a solar tube. For most sizes, at least one rafter will have to be cut, requiring the rafters around it to be doubled. Even without cutting, the process will require careful work finishing the inside of the room and installing the flashing 2 to prevent leaks. The common perception is that skylights are prone to leaks, which usually occur because of improper installation. For these reasons, installing a skylight is a task best left to a professional. On the other hand, solar tube installation is much easier. The whole job can take as little as two hours but certainly no more than a half day. The dome is installed on the roof with the proper flashing 2, and the tube is extended from the dome to the room’s ceiling. The diffuser is then set into the ceiling without needing to do more than minimal interior finishing work. The more expensive of the two systems is the traditional skylight, mostly due to the more extensive installation required. 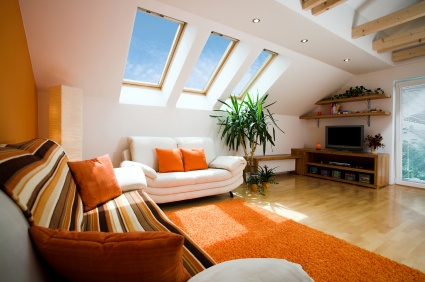 A basic skylight will start at $200 and increase with UV protection or other coatings. Add $100 or more in order to have a vented model operated by a remote control or wall switch. Attached shades add $200 to $400 more. Installing the skylight will cost between $400 and $1,300 depending on the size and complexity of the roof. This adds up to an average cost of $650 to $1,900 for materials and installation. As an example, adding a 2 x 4-foot fixed skylight to a home will cost approximately $250 for the skylight kit, about $90 for the flashing 2 kit, and about $1,200 for the installation, totaling $1,540. It is possible that the addition of a skylight will add to the resale value of the home, perhaps as much as $2,800 for a vented skylight, but a local realtor should be consulted. On average, installing a solar tube will cost less than half as much. A basic solar tube materials kit costs between $153 and $425 depending on the size and features. LED light kits can be added to use the diffuser as a traditional light at night. A vent kit or daylight dimmer can be added as well. If professional installation is chosen, the cost will be $250 to $300 for a 10- or 14-inch tube. Costs will rise for larger models because rafters will have to be cut to accommodate them. This totals about $400 to $1,000 for materials and installation. As an example, installing a standard 14-inch solar tube in a room will cost approximately $250 for the kit, and installation will cost about $300, for a combined total of $550. As an added financial benefit, adding a solar tube can result in a 30 percent energy tax deduction. This is because of the limited heat gain and the EnergyStar® ratings on some models. The more energy efficient of the two is the solar tube because light is captured and diffused into the home, unlike the direct sunlight of a skylight. Skylights allow up to three times the direct sunlight than regular windows. This creates energy loss through heat gain, especially during the summer and in hot climates. Some measures can be taken to minimize this effect. Using Low-E glass and/or coatings will help. Also, the skylight should be mounted on the north face of the roof, if possible, to have more indirect light during the day. Still, looking at unwanted heat gain alone, a solar tube is a better choice. Solatube, a manufacturer of solar tubes (pictured above), which they call “daylighting,” says that their systems are EnergyStar® rated, partially due to the minimal solar heat gain. Skylights can be filtered to cut down UV rays, but the solar tubes will be more effective since the UV rays are blocked at the solar dome before entering the tube. This is very important because UV rays can be harmful to a home’s residents and furnishings. These rays are responsible for sunburns, eye damage, premature aging, and skin cancers, which means that it is important to block them as much as possible. They can also fade fabric, furniture, and artwork. Solar tubes are so effective at blocking harmful radiation that professionals recommend they be installed on the southwest side of the home to capture as much sunlight as possible. One commonly voiced concern with skylights is the possibility of condensation on the inside of the skylight surface. 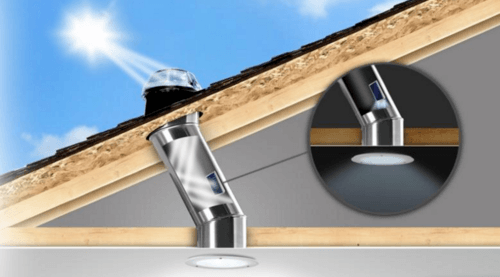 According to Velux, manufacturer of both traditional skylights and solar tubes, condensation on skylights is usually caused by excess moisture in the home and can be reduced by using a humidifier. With a solar tube, condensation can be an issue inside the tube in climates with high humidity. This can be prevented by wrapping the tube section with R-15 or R-19 insulation. Some people prefer traditional skylights because their appearance adds to the ambiance of a room. Having a view of the sky by day or night can be a way to extend the room into the outdoors. Others choose solar tubes because they think that a solar tube diffuser is non-obtrusive and looks similar to a standard light fixture. In this category, the differences are simply a matter of taste. Skylights and solar tubes can be used in both warm and cold climates. Areas of heavy snow, of course, will have no benefit from either type during most of the winter. Some allowances should be made for extreme temperatures. An acrylic skylight is more susceptible to damage and cracking when subjected to very high and very low temperatures. Skylight glass is a better choice for these climates. Areas subject to hurricanes should consider polycarbonate 1 as a material for either a skylight or a sun tunnel dome to prevent breakage. Both Velux and Sunoptics manufacture skylights and solar tubes. In addition, Fakro is a maker of skylights. Solar tubes are also made by Solatube (pictured above) and ODL. How much does it cost to install skylights or solar tubes in my city? Cost to install skylights or solar tubes varies greatly by region (and even by zip code). To get free estimates from local contractors, please indicate yours.